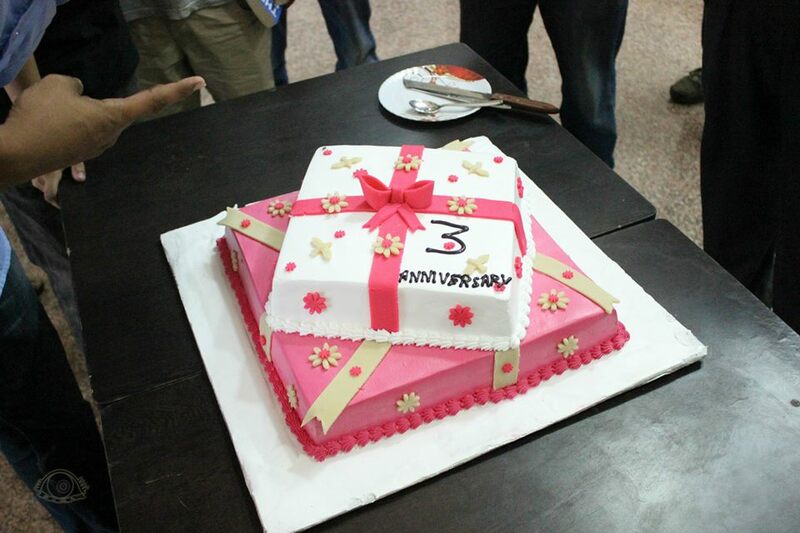 Indian Institute of Management Udaipur celebrates its third anniversary! It was 27th July 2011 when Indian Institute of Management, Udaipur joined the league of the premier business schools across the country. The foundation laid by its Director – Prof. Janat Shah remains firm as the institute completes its 3 years full of enthusiasm, aspiration and accomplishments. It is an important milestone in the institute’s journey of becoming a unique establishment in all the facets of management education. 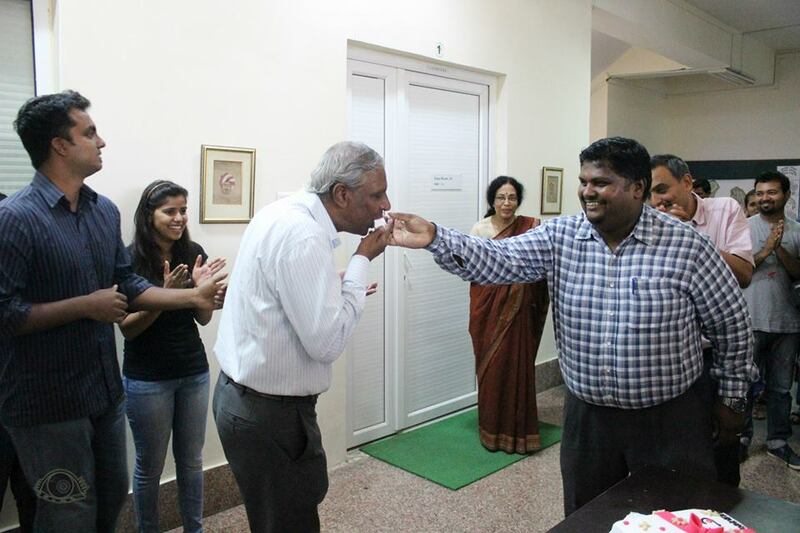 The auspicious occasion of IIMU’s third anniversary was graced by the presence of the institute’s Director and was celebrated jointly by the students, faculties and staff members. 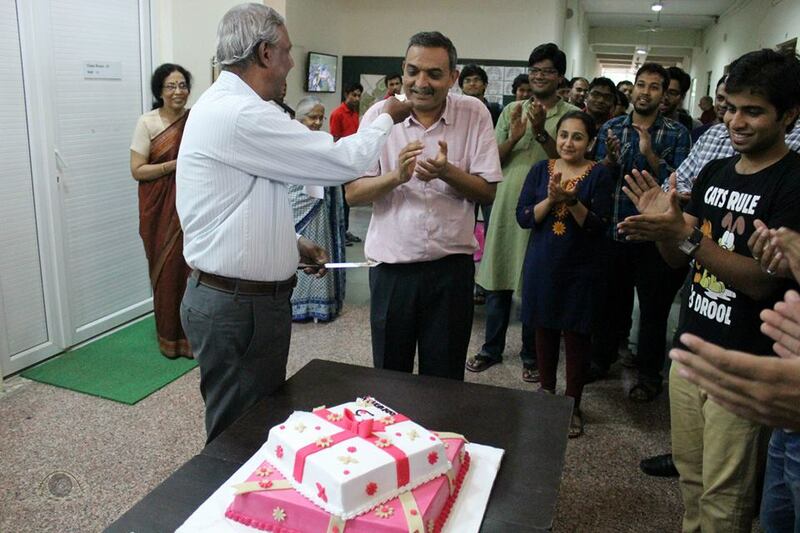 The biggest asset of the institute, its students, organized a cake cutting ceremony in all high spirits and greeted everyone on the anniversary. The pride was visible among all the members of the IIM Udaipur Community as they described the event as – “three years of togetherness, three years of sharing & caring, three years of happiness, three years of trust and three years of transformation “ . The event progressed with a motivational address from Prof. Janat Shah, who congratulated the complete IIMU Community comprising students, faculty and alumni for being an integral part of the journey. His reminiscence of the institute’s achievements from the past 3 years elevated the students’ beliefs. IRIS – The Photography Club of IIM Udaipur enthusiastically helped in covering the ceremony. IIM Udaipur strives to become a globally accepted academic institution. The ideology prospers as the students and faculty members dedicate themselves to develop socially responsible and confident business leaders. A constant motivation and support of pursuing a path less travelled of entrepreneurship imbibed with a sense of social and economic value creation encourages students to grow multi-dimensionally. The all-inclusive growth value driven in the institute’s initiatives can be measured by the triumph of the recently concluded event, Inclusive India Forum 2014, which was graced by the presence of eminent corporate and social personalities across the nation. Progressing forward, the institute has lined up events such as Spandan 2014 – Second edition of its Annual HR Conclave and the institute’s flagship event The Leadership Summit 2014. With three years of education, excellence, innovation, transformation and uniqueness, IIMU promises to grow abound with its leadership, values and uniqueness quotient and is on a fabulous journey towards becoming one of the top B-Schools of the world. Things which differentiate IIM Udaipur – Entrepreneurship! The economies in nations across the world are facing saturation of opportunities and cut throat competitions in complex business environments. The need of the hour is to not just build and run successful businesses but to carry an entrepreneurial mindset in any career role chosen by the future managers. IIM Udaipur follows a pedagogy which strives to inculcate the spirit of entrepreneurship in its students. Under the leadership of IIMU’s visionary Director – Prof. Janat Shah, the institute has taken several initiatives to foster the spirit of entrepreneurship in the institute’s foundation. Students are given ample opportunities to develop into effective self-starters and self-motivated leaders who can generate employment options for others as well and hence add value in the economy and society. The Director himself conducts Open House Idea Sessions with the students where the students put forward their plans which are discussed and brainstormed among the peers to enhance their implementation potential and directives. Faculty provides mentoring to the students to help them in shaping their ideas into ventures. A number of eminent speakers who left the cushions of job security and created reputed ventures are invited to the campus to conduct sessions for the students. The PGP office also aids the strengthening of the entrepreneurial space of students by introduction of subjects like Entrepreneurship, Social Entrepreneurship, Courses of Independent Study etc. which promote students to learn the trade while integrating the lessons into their academic grading and evaluation. Placement Holidays are also provided to students along with seed capital help for incubation of ventures and deferred back up placements offers so that students can independently and dedicatedly work on their business models without losing on their other career options. Several students driven activities have been running out of campus and in the areas in & around the vicinity of local community. Saksham – The Entrepreneurship Club of IIMU promotes the culture of entrepreneurship through the strata of its events and activities like Ideate Start-up Workshop, B-Plan Competitions, Live Projects et al. The success of its flagship event, Prarambh – The 32 Hour Start Up Challenge, a one of its kind event in India and the award of Best Debutant Entrepreneurship Cell in the North Zone given by National Entrepreneurship Network (NEN) showcase the testimony of the excellent efforts put by the club in sustaining the culture of entrepreneurship in the campus. Prominent tie ups with bodies like NEN, The Indus Entrepreneurs (TiE), Rajasthan Angel Investors Network (RAIN), Microsoft Ventures, 91 Spring Board, Cynapta and Start-Up Oasis among others are increasingly establishing entrepreneurship as a firm pillar of the institute. Things which differentiate IIM Udaipur – Rural Immersion! Immersion lies at the heart of pedagogy of teaching and delivery at IIM Udaipur. The idea behind immersion is to get students dive into real life environment and explore the learning perspectives themselves. A special feature of the first year of the PGP Programme is the course on Indian Social and Political Environment which attempts to provide insights to students about the inherent social and political issues in a developing country like India. The course strives to make students think on their feet about the role which managers need to play in the 21st century and how out of the box solutions can be derived by lessons of management education for the social problems prevalent in economies. Rural Immersion Programme is a part of the course wherein the students have to visit the tribal villages of Southern Rajasthan in their respective study groups and stay there for a week. The motive of the programme is to provide the students insights about the nature of the challenges in the rural life of India and the efficacy of existing efforts to address them. Students collaborate with NGOs functioning in the areas from a significant period of time. During the course of the programme, students interact with inhabitants of the villages and the local administration, fill in surveys and try to understand the social life and Human Development Indices in these areas. The outcomes which the students are expected to deliver are recommendations of better solutions for realization of optimal health, education and livelihood drives. The learning is complemented by a change in outlook towards government initiatives like NREGA with better understanding and appreciation for the bureaucratic services functions and the difficulties in design and implementation of development programmes at the grass-root level. The solutions and means of employment generated in the villages also teach about the perspectives of consumers and producers from the bottom of the pyramid. The untapped potential of the Rural Market can be well utilized by the socio-entrepreneurial ventures in which a lot of big and reputed organizations are faring into. The programme becomes a life changing experience for the students with takeaways of socio-economic problems still prevalent in the society like illiteracy, poor healthcare infrastructure, malnutrition, unemployment, dowry, child marriages, corruption, nepotism et al. The awareness comes from living with the hamlets of families in the villages about the aspects of life like natural environment, mutual sharing of resources, agents of change serving selflessly in NGOs, compassion and power of communication. The long term vision behind the transformational initiative is to sensitize the students and develop socially conscious managers who can work in future towards collective and inclusive growth of the society. 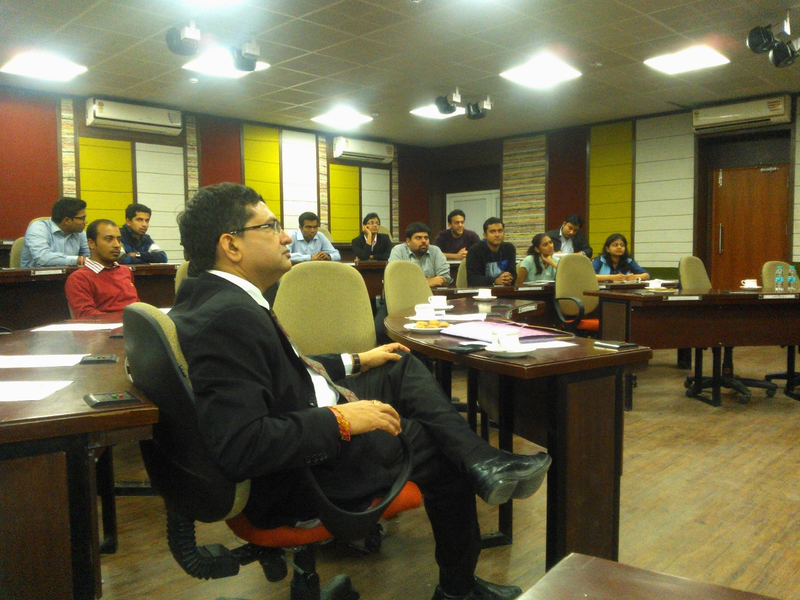 Finomina – The Finance Club of IIM Udaipur organized the 4th edition of FinTalk on 1st February, 2014. 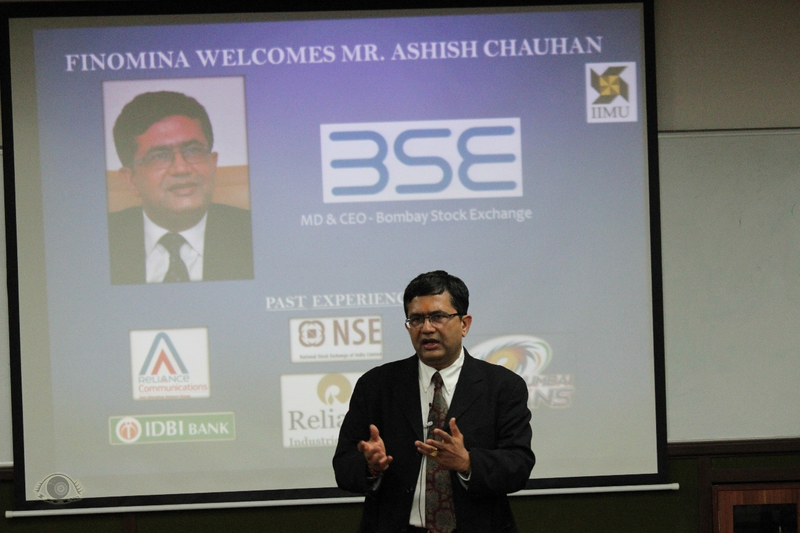 The session was presided over by Mr. Ashish Chauhan, CEO & MD, Bombay Stock Exchange. Mr. Chauhan is an IIT Bombay and IIM Calcutta alumnus and he is one of the pioneers of the modern trading markets of India. His journey has seen multiple career dimensions encompassing strategy, finance, marketing, operations, policies, microstructure, information technology, organized retail, telecommunications, Indian social issues and cricket growing along with the growth of the financial market and economy of India. Popularly known as the father of modern financial derivatives in India, Mr. Chauhan spoke in lengths about his stay at IIMC and his work with IDBI. He shared the challenges he faced being a part of the core team that founded NSE and the regulatory norms in the business set by SEBI, FICCI and CII of which he is an eminent board member. Quoting “Life is very random”, Mr. Chauhan spoke of how things at NSE led him to the role of CIO at Reliance Communications and later as the President & Group CIO of Reliance Industries Ltd.
Mr. Chauhan laid stress on the importance of proper execution and how good strategy coupled with proper execution can work out wonders. He related this with his tenure as the CEO of Mumbai Indians. He also discussed about the strategies adopted at the BSE and competitive advantage in its rivalry with NSE. He explained students about the intricacies of the trading business and how good strategies fail when traders start believing in their bluff, thus explaining the students about the need of sound judgmental skills in making business decisions. He also laid importance on the use of sophisticated technologies and new trends like Algo Trading in business because speed and fast information flow form the essence of effective and competitive business practices. He mentioned the examples of failure of over the counter exchange and how modern trends have significantly changed the ATMs, Liquidity, Derivatives, Nifty, Futures, Options and Forwards in the market. The sessions turned out to be extremely informative and engaging as it was full of anecdotes from real life experiences which he interspersed in his talk. Mr. Chauhan also urged the students to develop entrepreneurial skills and to contribute to the society in any way they can. The student community was present in large numbers during the session to learn from such an experienced member of the industry. 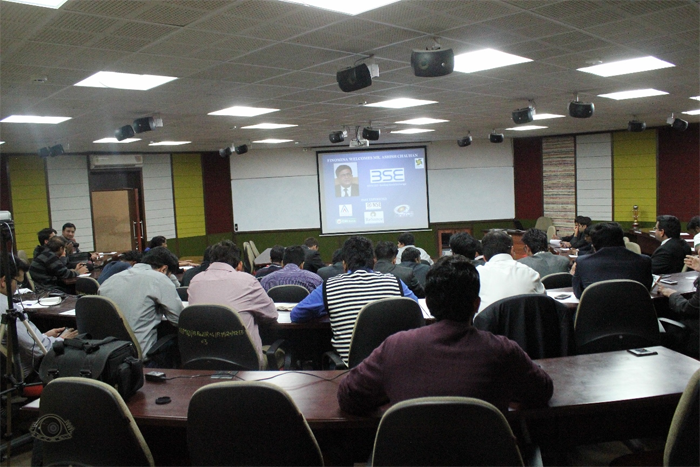 The objectives of such sessions conducted by Finomina and other clubs & committees at IIMU are not only to learn about the industry that the speakers represent but also to form relationships with them and with their companies for collaboration in designing academic curriculum and other activities on campus. IRIS – The Photography Club of IIM Udaipur helped in coverage of the event.